Employee Engagement | Motivate Employees | Thank God it's Monday! Creating a workplace where employees enjoy coming to work, feel appreciated, and give discretionary effort should be the goal of all managers. The following show how the science of behavior and the power of positive reinforcement can support leaders in creating an environment where employees and productivity thrive. Getting employees engaged in the workplace is an ongoing challenge for organizations. While there is plenty of advice floating around in management books and online business journals, not much of it is grounded in science and usually fails to create any real change. Learn why Dr. Aubrey Daniels advocates focusing on employee reinforcement rather than employee engagement. Running out of ways to motivate your employees? This slide show from Inc.com suggests 7 unconventional ways to reach your employees. From incorporating fun into daily work to writing a hand-written note, these ideas will help bring positive change to your workplace. Annual bonuses and non-contingent monetary rewards aren’t very effective in improving employee performance. Even though many companies will be handing out year-end bonuses this month, this practice typically leads to more bad than good. Learn about performance pay and what you can do differently to make the biggest impact on productivity in the workplace. Making work a place where people enjoy spending their time may seem like a challenge but what if you could have your employees saying “Thank goodness it’s Monday!”? This classic article offers tips on how to celebrate accomplishments so that employees are provided with opportunities to share their success and take pride in accomplishing their goals. What Do You Find Reinforcing? Take part in our live poll. Organize and prioritize your daily activities with this Performance Management Planner. This handy workplace tool will help you to build productive habits in PM and is guaranteed to improve your focus and impact. Organized into three sections, this tool will help with self-management, influencing others, and tips for using positive reinforcement and other behavioral applications. Also available in Spanish. 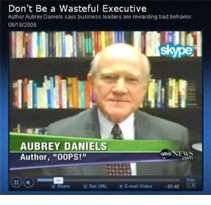 Watch as Dr. Aubrey Daniels discusses the importance of behavior in the workplace and why managers ought to be paying more attention to it in this ABC News interview. It’s an inevitable practice in most organizations but, even well intended, they can backfire. Hear why the best way to distribute performance bonuses is by setting clear requirements for employees so that bonuses are earned, not just handed down.